Black mustard seeds are the black round dots. Split black gram is the oval black spots, one side round, the other flat - where the pulse was split into two. I felt like making a quick but tasty breakfast this morning. Something that involved nothing more than light chopping and adding a sequence of ingredients to a hot pan. Something humbly seasoned, with a little nuts, seeds, fruit, vegetables and protein. Something that'd offer me some smiles but would quickly free me to hop back into bed with the newspaper. Change the ingredients below to fit what you have in your kitchen. While usually plenty fun, leaving for groceries steals coziness from a meal in bed, regardless of whether you're alone or not. I started with the base from an upma recipe that I wrote about earlier: peanut oil, split black gram, mustard seeds and cashews. You may skip the black gram - but it adds a soft crunch. 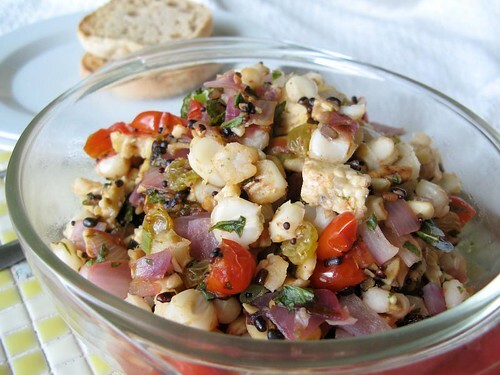 Replace the basil and curry leaves, use another seed like sunflower or sesame, substitute olive or canola oil, switch chickpeas (garbanzo beans) for tempeh, change hominy to cooked rice or ripped up small pieces of bread. Use color, like red onions, yellow raisins and green herbs. Make whatever changes are needed, so you don't have to leave your home (so long as you have some basics). To get maximum flavor from the garlic, liberate its oil by smashing and scraping chopped pieces of the clove with the edge of a knife - grinding the pieces into a paste, using salt for grit to help. Heat a pan on medium with just enough peanut oil to make it shine. Throughout the cooking, make sure to stir every few minutes to make sure nothing's sticking. Toss in the split black gram, black mustard seeds and cashews. Wait a few minutes for that to toast, then add tempeh. Wait a few more minutes for that to toast and stir in the onion and garlic. If the basil and curry leaves are dry, add them now to rehydrate them (if fresh, wait until near the end). After the onion sweats its juices and dries, after a few minutes, grate the ginger in and stir in a chopped chili. Stir in hominy, salt and tomatoes and heat until warm. When hot and ready to serve, mix in lemon juice (and basil and curry leaves if using fresh ones). Serve with hot coffee, a toasted English muffin and the Sunday New York Times.